Cyberattacks, data breach, privacy of customers, citizens and employees’ personal information, together with the opportunities to create value from data and information held by organisations – are major drivers for organisations to implement a strategic approach to the governance of data and information as part of good corporate governance. Information Governance provides an overarching strategic framework for organisations seeking to control and secure information throughout their organisation, which both maximises the value of information and minimises the costs and risks of holding it. Twelve months ago, the Director-General of the Australian National Archives called for Chief Information Governance Officer positions to be created to lead the digital transformation in Federal government agencies. This article looks at different Information Governance leadership models being used in corporate and government organisations together with the views of Information Governance leaders in those organisations. Who is responsible for data and information? As the above lists highlights, the digital transformation over the past decade has created new roles and titles responding to the exponential growth of data to manage the risks and opportunities arising from data and information held by organisations. A key challenge for the continuing digital transformation and growth in data is for organisations to have internal organisational structures that align with organisational goals and objectives. In the context of responsibility for data and information, organisations require a cohesive governance structure to ensure data and information are effectively controlled and optimised to enable organisational objectives to be met. This is achieved through a formal Information Governance framework and effective Information Governance leadership. 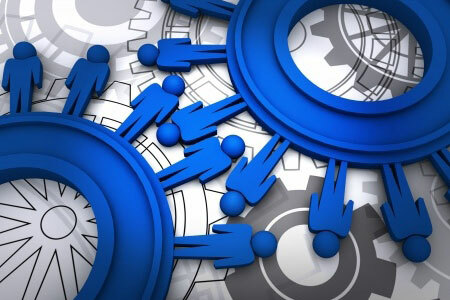 reduced costs and increased efficiencies arising from the implementation of an aligned strategy and policies, in contrast to the inefficiencies of the traditional fragmented siloed approach. Information Governance leadership is about leading and collaborating with professionals from different disciplines across the ‘information silos’ to align activities and technologies to maximise the value of information while minimising the risks and costs of holding it. With the exponential growth in data and the risks and opportunities of data and information held within an organisation, effective Information Governance is a key factor in delivering strong Information Governance, which is part of good Corporate Governance. The diagram below illustrates the typical areas within an organisation where data and information are managed and governed by policies, procedures, technology and people. The IG Steering Committee is a committee made up of the relevant C-level and other executives and managers responsible for different areas of information and data management. Ideally, the IG Steering Committee should be chaired by a C-level executive so that there is clear senior executive level support and direction. The direction and overarching strategy for Information Governance should be approved by the Board and CEO, who have ultimate responsibility for the governance of data and information. The Committee is responsible for setting priorities, such as deciding on pilot projects, carrying out reviews of implemented projects etc. The position titles of the members of the Steering Committee may vary between organisations and will depend on factors such as the size and structure of the organisation and the stage of IG development within the organisation. The composition of the IG Steering Committee may include the following – General Counsel (GC), Chief Information Security Officer (CISO), Chief Privacy Officer (CPO), Chief Data Officer (CDO), Chief Marketing Officer (CMO), Chief Data Scientist (CDS), Records & Information Manager (RIM) and others appropriate to the needs and priorities of the organisation. is well-structured, meets regularly, and has a clear agenda that is implemented and achieved. The National Archives has an Information Governance Steering Committee (IGC) which has been assigned by the Director-General to the Archives’ peak governance body, the Executive Board. The terms of reference set out that, ‘[t]he Executive Board added formal responsibility for Information Governance oversight to its role in October 2015 to ensure that the Digital Continuity 2020 Policy is implemented within the Archives and targets for agencies are met’. The National Archives has clear terms of reference for its IGC with defined functions, which provide a useful point of reference for organisations in the process of establishing a Steering Committee. the stage of Information Governance development within the organisation – that is, whether it is nascent, developing or established. GC who is experienced in eDiscovery, data breach and broadly understands data analytic technologies and the important opportunities they present to the organisation. A key issue for the organisation in adding Information Governance leadership responsibilities to the existing responsibilities of the C-level executive is whether they are able to adequately lead Information Governance as well as effectively discharge the responsibilities of their current position. This will depend on whether the additional responsibilities will be supported by the necessary resourcing to support their CIGO role and their current position, and whether they are able to delegate, as appropriate, current responsibilities to ensure they can dedicate sufficient time to their Information Governance responsibilities. Mastercard implemented an Information Governance program beginning in 2013 to assist with the digital transformation of the organisation at that time. Ms JoAnn Stonier leads the Information Governance and Privacy program for Mastercard on a worldwide basis. Ms Stonier sees the role of Chief Information Governance officer as, ‘leading strategy, building infrastructure, working with regulators, building partnerships, and defining best practices’. Transpower is the owner and operator of New Zealand’s national electricity transmission grid. It also operates the country’s wholesale electricity market. As a critical infrastructure provider, Transpower is part of New Zealand’s earthquake disaster response strategy, requiring a strong focus on accurate real-time asset information for business resilience and the continuing safety of their staff and service providers. Information Governance is led by the Chief Executive who sets the expectations and behaviours for everyone in the business by acknowledging the essential role data and information plays in underpinning every decision in the business. Transpower business relies heavily on robust records management. Ms Carol Feuerriegel, Enterprise Information Manager explains that, ‘long timeframes (5 to 25 years) for forecasting, planning and constructing transmission electricity infrastructure, combined with rapidly emerging alternative power sources, means Transpower needs to leverage reliable historical data and sophisticated predictive capabilities to make strategic investment decisions for the future’. Mr Andy Lavender formerly of oil and gas major Chevron and now Associate Director, for Information Governance and Reporting at The University of Western Australia believes the institution has demonstrated a sharper focus by advancing information governance through its Office of Strategy, Planning and Performance. He says, ‘this transformation has provided an opportunity to secure sponsorship at the executive management level. ‘Under its Digital Continuity 2020 policy, the National Archives recognises the role of chief information governance officer as ‘best practice’ for agencies committed to professional information management. 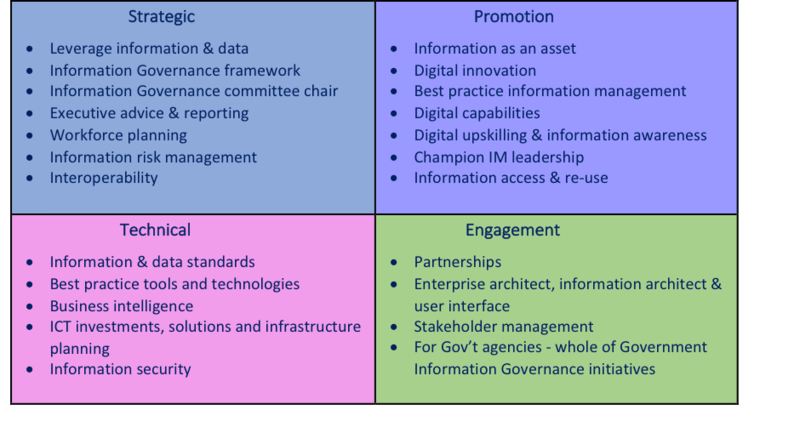 As well as leading information governance across an agency, the role is critical for digital innovation and capability, and for championing the importance of effective information management. The diagram below illustrates the leadership and co-ordination role of the CIGO to ensure that organisational goals and objectives are met by aligning the areas responsible for data and information throughout the organisation. What is the CIGO role? The CIGO is responsible for ensuring that information facets and the various departments responsible for data and information are aligned and working efficiently and effectively to minimise costs and risks and optimising value from information held throughout the organisation. The National Archives divide the CIGO’s responsibilities into 4 areas – strategic, technical, promotion and engagement. The following table sets out CIGO’s responsibilities – this of course will vary from organisation to organisation and will be impacted by strategic priorities, size, structure and resources. overall organisational strategic business goals and objectives. There are different types of Information Governance leadership models – the key is to select the model that is best suited to your organisation’s needs to enable strategic and cost-effective governance of information and data as well achieve overall organisational objectives. A well-executed Information Governance framework and program, with appropriate leadership should deliver effective security and control of data and information by minimising risks and reducing costs of holding information and maximising the value of information held by the organisation. 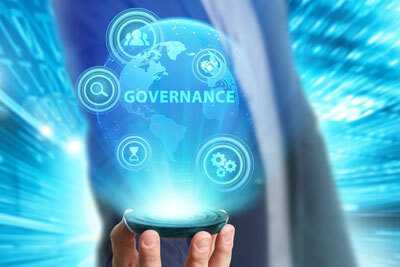 Effective Information Governance leadership will enable the organisation to deliver continual strategic and proactive governance as digital disruption impacts the organisation and digital transformation continues. Information Governance Initiative, Annual Report 2014, p28. The terms ‘information’ and ‘data’ are often used interchangeably but there are differences in meaning. This article provides an overview of why both Information and Data Governance are important for organisations seeking to control and secure information and an understanding of what each discipline does and achieves for an organisation. 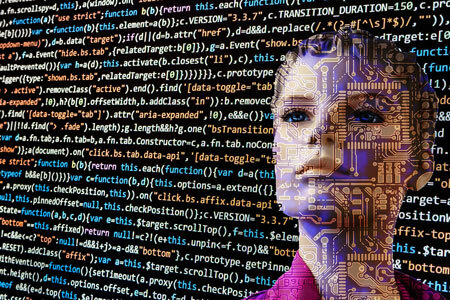 As the law lags behind in rapid technology innovations, particularly in big data, AI, machine-learning and the Internet of Things (IoT), there is increasing awareness and discussion about the merits of an ethical based approach to data analytics. This article considers why an ethical based approach can build trust and transparency with consumers, and why it should be part of good Information Governance, as a means of maximising the value of information derived from data analytics while minimising risks. Big data describes the large volumes of data held by corporations and governments. Using analytics technology tools, insights and knowledge can be derived from the data. These insights can then be used to make informed decisions, for example, in the development of new or improved products or services providing a competitive advantage and ultimately delivering results to the bottom line. In other words, there is big value in the information that can be extracted from big data for both the corporate and government sectors. In December 2015, the Australian Government released its Australian Government Public Data Policy Statement as part of the National Innovation and Science Agenda and recognised data as ‘a strategic national resource that holds considerable value for growing the economy, improving service delivery and transforming policy outcomes’. A large contributor to the exponential increase in data held by organisations is the growth of the Internet of Things (IoT). Cisco has estimated that by 2020, the total volume of data generated by the IoT will reach 600 ZB per year and global IP networks will support more than 26 billion devices connected to the internet (up from 16.3 billion in 2015). The IoT is the interconnection of devices to the internet and involves the transmission of data between the internet and those devices – e.g smart devices in factories, healthcare and smart buildings. Increasingly, it involves the connection of devices, i.e. ‘things’ and people in various aspects of their lives – e.g through fitness trackers, medical devices and Google Maps. The IoT enables the seamless integration of our devices with the internet, and with it our data. The UK Information Commissioner’s Officer (ICO) March 2017 report, entitled ‘Big data, artificial intelligence, machine learning and data protection’ [at para 11] describes the connection between big data, AI and machine learning as follows: ‘AI can be seen as a key to unlocking the value of big data; and machine learning is one of the technical mechanisms that underpins and facilitates AI. The combination of all three concepts can be called ‘big data analytics’. A key concern about the IoT and big data are the challenges it presents to maintaining privacy of personal information, particularly when analytics and profiling are involved. This is because the collection of personal data may involve not only data that has been consciously provided by individuals, but also personal data that is recorded automatically (e.g tracking of online cookies),or derived from other data or inferred through data analytics. Re-use of data for new purposes – that organisations which use collected personal data as a basis for predictive analysis must ensure that the analysis is compatible with the original purpose for collecting the data. Data maximisation where the value of data is linked to potential future uses – this can challenge the privacy principle that requires the processing of data must be adequate, relevant and not excessive for the purposes that have been defined and stated at the time of collection. Lack of transparency – lack of openness on how data is compiled and used may lead to consumers to decisions they don’t understand or have no control over – for example, in relation the use of data by data brokers and analysis companies. 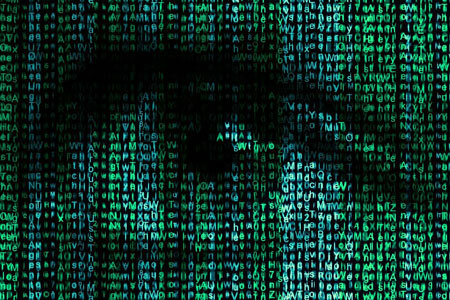 Compilation of data may uncover sensitive information – that a compilation of bits and pieces of information, which may not be sensitive themselves, may generate a sensitive result – such as being able to predict a person’s health. Risk of re-identification – through compilation of data from several sources, there is a risk that individuals may become identifiable from data sets which appear to be anonymous at first sight. 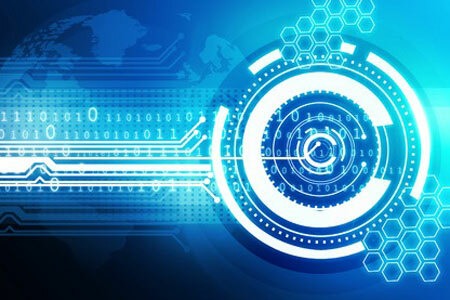 Security implications – the challenges of the additional infrastructure layers needed to process big data and encryption of large data sets; data breaches may have more severe consequences when large data sets are involved; and organisations that acquire and maintain large sets of personal data must be responsible stewards of that information. Incorrect data – the risk that decisions are based on inaccurate information, particularly when information is obtained from online sources and not official registries – for example, credit agencies. Power imbalance – between those that gather the data (large organisations and states) and individuals. Determinism and discrimination – because algorithms are not neutral, but reflect choices, among others, about data, connections, inferences, interpretations, and thresholds for inclusion that advances a specific purpose. Big Data may consolidate existing prejudices and stereotyping, as well as reinforce social exclusion and stratification. Chilling effect – this is the effect that people will restrict and limit their behaviour if they know or think that they might be surveilled. Echo chambers – which may result from personalised advertising, search results and news items so that people will only be exposed to content which confirms their own attitudes and values. The lack of transparency, as identified in the above report, in addition to trust, are key issues for consumers when it comes to providing personal information to organisations and can provide an important competitive differentiator. ‘The majority of Australians – 60 percent – have decided not to deal with an organisation due to concerns about how their personal information will be used. And significantly, 97 percent of Australians don’t like their personal information to be used for a secondary purpose. This is critical to big data. Because big data projects will often involve secondary use of data. The ICO 2017 report, titled ‘Big data, artificial intelligence, machine learning and data protection’, refers to ICO-commissioned research that shows ‘the more people trust businesses with their personal data, the more appealing they find new product offers such as smart thermostats and telematics devices in cars’. The HBR article and the ICO report support a business case for developing an approach that aims to build trust and is based on transparency and fairness. How can big data be used in ways that respect the privacy of individuals? An approach aiming to build trust and based on concepts such as fairness and respect, go beyond legal compliance and support an ethical based approach. Ethical considerations in relation to processing of personal information in big data are the subject of increasing global discussion and developments. ‘Guidelines on the Protection of Individuals with regard to processing of personal data in a world of Big Data’. The first principle of the Guidelines is the ethical and socially aware use of data. It stipulates that in the processing of personal data, controllers should adequately take into account the likely impact and the broader ethical and social implications, and that it should not be in conflict with the ethical values commonly accepted in the relevant community or communities and should not prejudice societal interests, values and norms, including the protection of human rights. In Australia, the NSW Data Analytics Centre was established in late 2015 to become a leader in whole-of-government data analytics to provide insights into complex policy problems and improve service delivery for the community. To help support this work and address the larger challenges of data sharing, a Data Sharing Taskforce was established in 2016 with participants from Australian peak bodies such as the Australian Computer Society, state and commonwealth governments, and private sector representatives to address the overarching challenge of developing privacy preserving frameworks which support automated data sharing to facilitate smart services creation and deployment. The Taskforce’s report, expected to be delivered within the next 6 months, will identify best practice, models and frameworks for data sharing in the Australian privacy context. 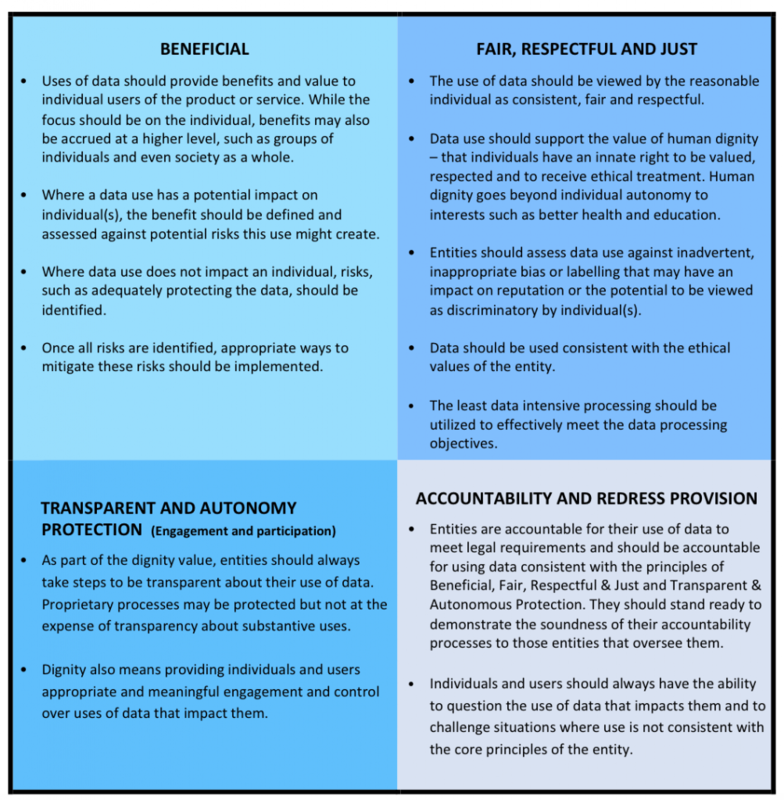 The IAF sets out the ethical data use principles in the paper, ‘Decisioning Process, Risk-Benefits Analysis Tool for Data Intensive Initiatives – Achieving Legal, Fair and Just Use of Data & Appropriate Individual Engagement’. The ethical principles articulated indicate that data use should be Beneficial, Fair, Respectful and Just, Transparent and Autonomy Protecting and performed with appropriate Accountability with a Redress Provision. The considerations for each of these ethical principles as proposed by the IAF are set out in the table below. The need for an ethical based approach and the formality of the process will depend on the context, such as the size of the data set or sets and the amount of personal data to be processed within them. Whether a formal ethical framework or an ethics committee should be established will depend on the type and recurrence of data analytics being carried out and will vary across industries as well as government departments. A comprehensive approach would include an internal ethics committee for the collection of data and data analytics. The ICO report into ‘Big data, artificial intelligence, machine learning and data protection’ points out [at para 176] that ‘a large organisation may have its own board of ethics, which could ensure that its ethical principles are applied, and could make assessments of difficult issues such as the balance between legitimate interests and privacy rights’. Universities have a long history of research ethics committees and there are examples of medical and health organisations with an ethics based approach to the collection of data and data analytics. For example, the Centre for Epidemiology and Biostatistics at the Melbourne School of Population and Global Health developed the Guidelines for the Ethical Use of Digital Data in Human Research. As the ICO report points out [at para 176], an important issue ‘is the organisational relationship between the ethics board and employees with responsibilities for data and analytics, such as the chief data officer and the data protection officer’. This highlights the importance of an overarching Information Governance approach between those managing the data, those responsible for its protection – i.e the chief privacy officer and legal teams, those performing the data analytics and those using the information obtained to ultimately derive value from it. Costs arising from an actual or perceived loss of trust by consumers and negative impacts, such as, ongoing damage to reputation and/or a negative impact to the bottom line. Information Governance, privacy frameworks and the management of data analytics initiatives need to be aligned with overall strategic objectives led from the top down, comply with the law, and where technology is lagging behind the law, an ethical based approach should be used. An ethical based approach should be embedded into the organisation to enable employees working on data initiatives to have a clear mandate to apply guiding ethical principles or an ethical framework. The way in which an ethical based approach may be embedded into an organisation will vary according to the types of data initiatives being undertaken, the volume of personal information involved or the potential for personally identifiable information. Ethics committees or internal ethics boards. As the IAF paper sets out whether the project is a core product review, the broader use of information, or a big data analytics project, an assessment process is required to address the legal, ethical, fair and other implications of information use. 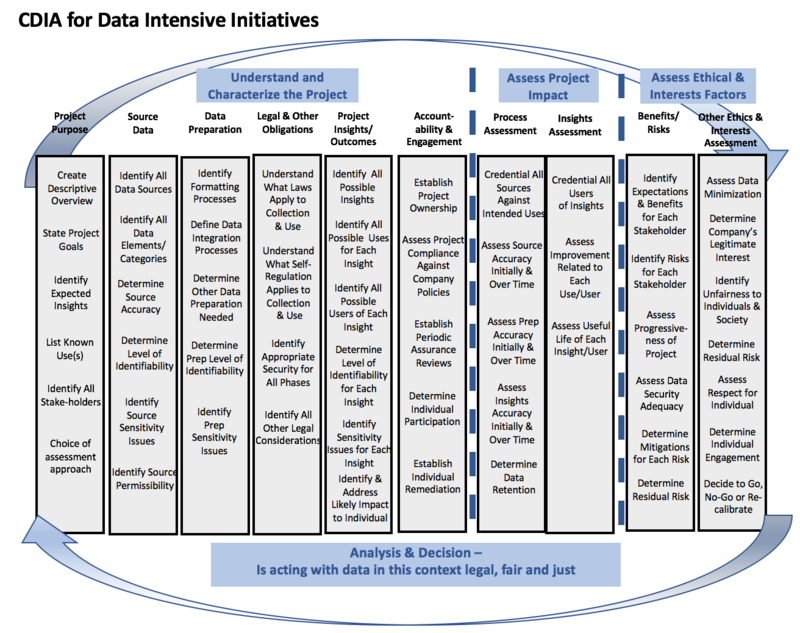 The IAF paper proposes a Comprehensive Data Impact Assessment, as set out in the figure below, for data intensive initiatives to adequately and systematically (operationally) determine interests/impact to stakeholders, including specifically the individual. What aspect of collection/acquisition/processing/analysis or use of the insights could be considered unfair to the individual or to society? Is the collection/acquisition/processing/analysis or use of the insights done in a way that is respectful to the individual? Has the minimum possible amount of data been used? Does the company have a legitimate interest in the processing of the data and the use of the insights? After all mitigations have been applied, what is the residual risk to all stakeholders, particularly the individual – have the benefits and risks been effectively balanced? Have the interests, expectations and rights of individuals been effectively addressed? What additional, contextual based participation and choice (meaningful) with the individual should be considered? Is there an effective redress option for the individual impacted? Has this use of data been transparent? After considering all the above factors, is the project a ‘go’, ‘no-go’ or should some aspect be recalibrated to reduce the residual risks? Organisations should implement strong Information Governance including privacy frameworks that include data impact assessments and an ethical based approach where data analytics of big data involving personal information is being undertaken. The benefits of an Information Governance framework enable an organisation to take a strategic approach to both maximise the value of information derived from data analytics as well as minimise the risks arising from the costs of legal and regulatory privacy compliance, costs arising from data breaches and/or responding to regulators, as well as costs arising from loss of reputation, particularly where there is a breach of trust with consumers. The type of ethical based approach, such as, whether it is an ethical value or policy statement, or an ethics committee, and formal data impact assessments including an ethics assessment will depend on the types of big data initiatives being undertaken, the volume of personal information involved or the potential for personally identifiable information. An ethical based approach will ensure that the processing of personal information in big data analytics is carried out in a fair, transparent, responsible and ethical manner. The benefits of an ethical based approach and data impact assessments include the ability to build trust and transparency with consumers, ultimately delivering long term benefits to both the consumer and the organisation. If you would like assistance reviewing your current Information Governance ecosystem or developing an Ethical Framework or ethical based approach to data analytics within your organisation, please contact Susan on +61 2 8226 8682 or email susan.bennett@sibenco.com. What exactly is their purpose, and how do they differ from one another? Information Governance is a fundamental part of good Corporate Governance. Its mission is to maximise the value of information while minimising the costs and risks of holding it. Data Governance is a key subset of this model. It aims to control information at the data level, ensuring the maintenance of accurate and high-quality data through the implementation of appropriate systems and processes. This article looks at the roles Information Governance and Data Governance play within an organisation and how they are interlinked. Information Governance provides a strategic framework for organisations seeking to control company information. It recognises the value and opportunity of data as ‘the new oil’ and identifies the risks and costs involved in the event of non-compliance with legal requirements and the consequences of a serious data breach. 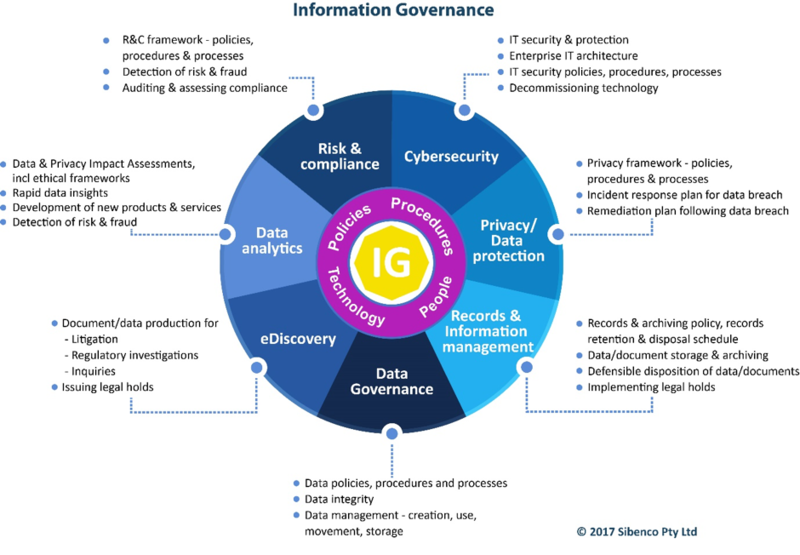 In other words, Information Governance encompasses the systems (including policies, processes, and technology) by which information is controlled and secured. Organisations should consider information as an asset and measure both the value and costs of the data they hold. This means quantifying the financial benefits of data as well as the costs (and subsequent savings) resulting from risk management investments. To derive value from information, companies need to invest in technology and systems that can be used to gain a competitive advantage and deliver benefits directly to the bottom line. This includes the implementation of data analytics to improve or develop new services or products, or data sharing systems to enhance, for example, the allocation of resources for the delivery of health services in the public sector. Minimising the risks and costs of holding information is one of the main objectives of an Information Governance program. Further strategic investments are needed to achieve this, specifically in technology, systems and people. Data protection and privacy obligations. Document/data production in litigation – eDiscovery. Well managed organisations have an active defensible disposition of records program, which eliminate documents no longer required by law and governs the ongoing removal of redundant, outdated and trivial documents (ROT) from the business. The costs of managing large volumes of data including additional resources (personnel) and storage costs. The costs of ‘back ended’ services – for example, analytics services to find documents, information audits and other forensic services that may be required from time to time. The cost of producing documents/data for litigation and regulators – eDiscovery – which has grown into a $10 billion per annum global industry due to the exponential rise in data volumes held by organisations. Costs of data breach notification. Costs of responding to regulators. Ongoing lost revenue and profit due to brand and reputation damage where personally information is disclosed, such as customer and employee information. Costs of litigation including class actions. A privacy framework with policies and processes aligned with the Information Governance program, protecting personally identifiable information and upholding a culture of privacy through training and auditing. Ensuring the implementation of appropriate cyber incident reporting, both internally and to external regulators, as required under mandatory notification breach legislation, cyber incident response and business continuity plans. Training of all relevant personnel (including IT, privacy and legal) to equip them to respond quickly and adequately in the event of a data breach. Data Governance is a key subset of Information Governance. Its objective is to control data at the data level and to ensure integrity through appropriate systems and processes. The purpose of Data Governance is to implement effective data management, ensuring that data is of high quality, accurate and reliable. Data Governance programs rely on the implementation of specific data policies and processes within an organisation, where the management, cleansing and storing of data follow strict standards and procedures. Increasingly Data Governance is managed by a Chief Data Officer (CDO) or equivalent who is responsible for setting data governance policies and procedures and implementing and monitoring systems to ensure that data is reliable and of high-quality. In recent years, a new role of Chief Information Governance Officer (CIGO) for overall responsibility of information has emerged to ensure Information Governance and organisational objectives are met. 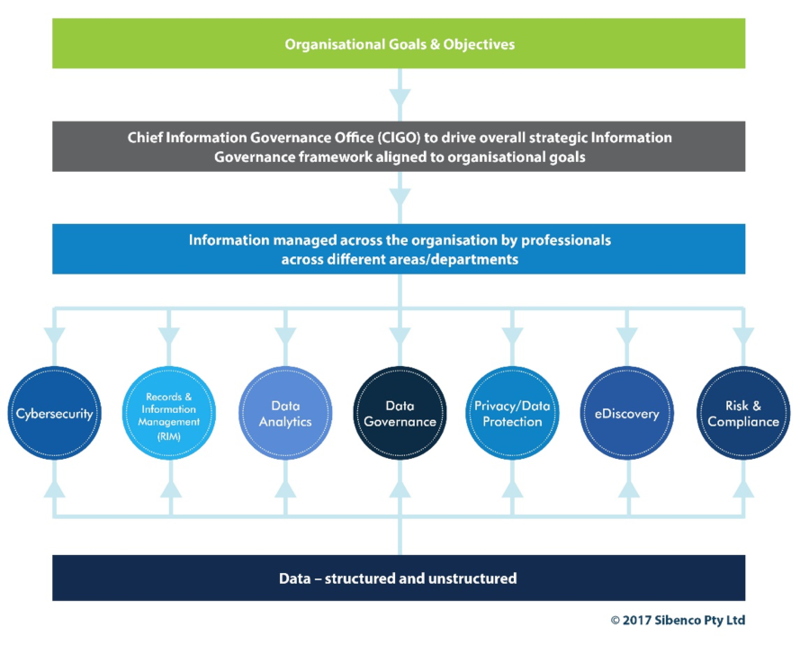 Whether the leader is an Information Governance steering committee, a designated C-level executive within their current existing role or a CIGO, the task is to successfully align Information Governance systems (including technology), processes and people to meet the organisation’s overall strategic business objectives. 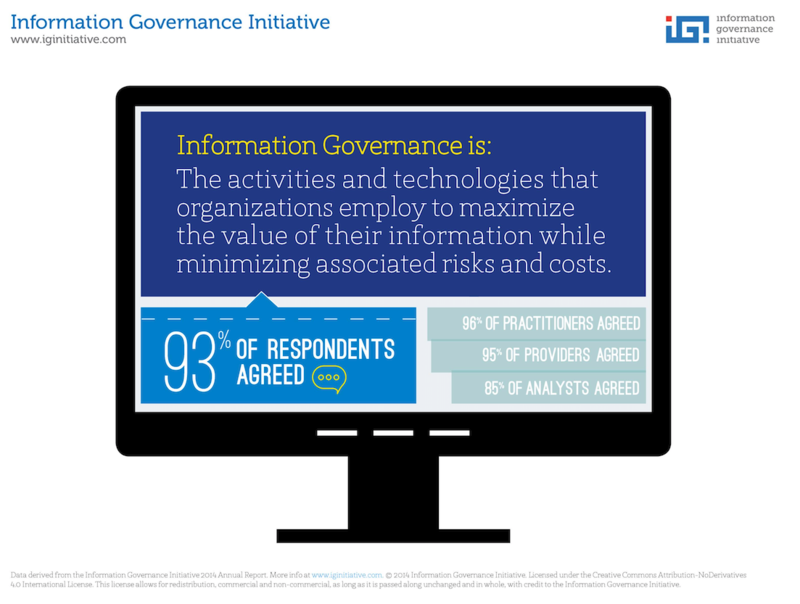 Information Governance requires top down leadership. Boards and senior management are responsible for ensuring that an appropriate Information Governance framework, systems, and policies for information management activities are in place and being adhered to. 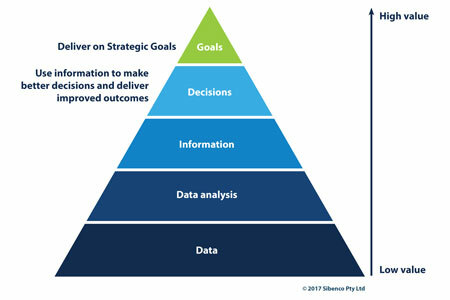 It also requires those responsible for information across the various silos to work collaboratively to ensure that information strategic objectives are met and risks managed appropriately. Information Governance and Data Governance are both increasingly important as the volumes of data held by organisations continue to increase at exponential rates. In summary, effective Information Governance ensures that the business value of information is maximised and the risks and costs of information are minimised while an effective Data Governance program ensures that the data being held is accurate and reliable. Susan is a lawyer and business advisor with twenty-five years of experience and works closely with corporate and government clients to deliver tailored legal and risk management solutions that meet client needs and strategic objectives. If you would like assistance reviewing your current Information Governance ecosystem, please contact Susan on +61 2 8226 8682 or email susan.bennett@sibenco.com. Connect with Susan on LinkedIn and follow Sibenco to receive updates. This article was also published in the September 2017 issue of Governance Directions.